2018 ended up being a distinctive year for venture capital, just about any way you look at it. Despite a decreasing deal count, the industry managed to reach recent highs in invested capital, total value of funds raised and exit value. Outside the borders of the U.S., global funding was pushed to its highest level since 2000, led by a dramatic increase in mega-rounds ($100+ million deals). All in all, we saw 2018 as a good year for entrepreneurs, investors and LPs alike as innovative companies and technologies in healthcare and technology continued to flood the market. The major headlines of the year revolved around the integration of artificial intelligence and machine learning across industries and the functional application of big data. While 2017 may have been considered the year of cryptocurrency, specifically Bitcoin, 2018 became the year of affordable transportation. E-scooter-sharing companies, such as Bird and Lime took over the streets of U.S. cities, seemingly overnight. In fact, in 2018, Bird was named one of Time Magazine’s “50 Genius Companies” and became the fastest company to ever reach a $1 billion valuation. One month after joining the unicorn club, Bird secured an additional $300 million of funding, pushing the company to a $2 billion valuation. However, Bird was not alone. In fact, 52 other U.S. companies passed the $1 billion valuation mark, making 2018 the year with the most new unicorns, demolishing the prior record of 42 in 2015. The astronomical valuations seen in 2018 were often driven by multiple mega-rounds of funding, of which 2018 had plenty. 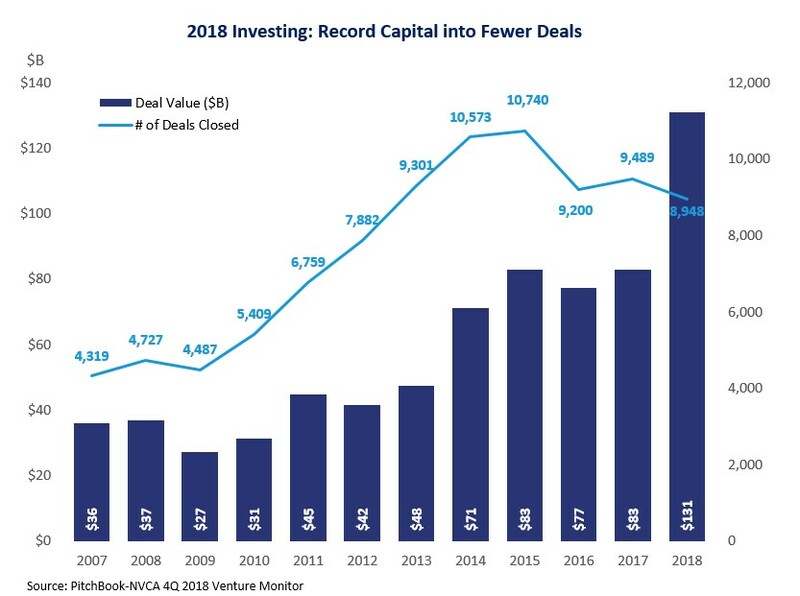 Driving the trend toward fewer, bigger deals, U.S. companies raised a record number of mega-rounds in 2018 with 184 $100+ million funding rounds. Among the most notable of these deals were Altria Group’s $12.8 billion investment in Juul, Lyft’s $1.7 billion deal led by CapitalG, and Softbank Group’s $1 billion investment in shared office space provider, WeWork. 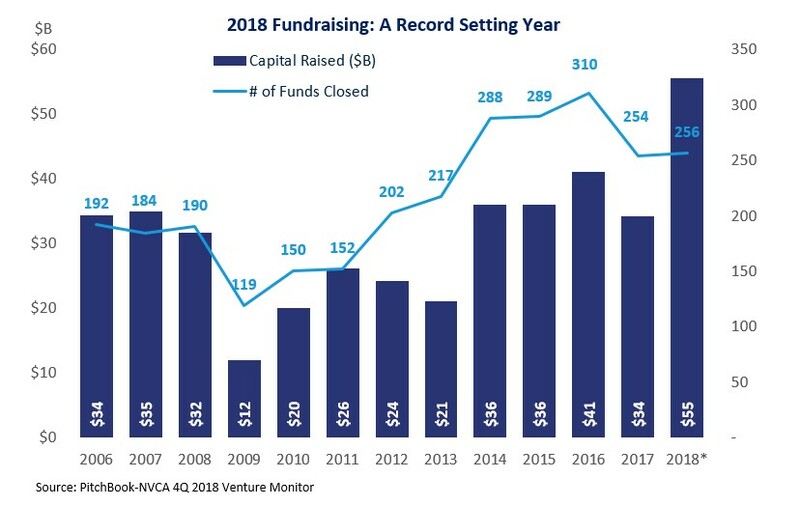 Despite fears of an eventual market downturn, venture fundraising reached a record high in 2018, raising over $55 billion across 256 funds. In comparison to the decline experienced in 2017, this is a dramatic increase in capital raised even though fund count remained relatively flat. This sharp increase can be attributed to an overall proliferation of firms raising $1+ billion funds as they attempt to remain competitive in a market where increasingly mature companies demand larger rounds of financing across stages. Driven by the massive $12.8 billion funding of Juul, capital invested surpassed $100 billion for the first time since the dot-com era despite deal count falling 6%. In part due to the record level of capital raised throughout the past five years, capital invested in 2018 reached $131 billion, surpassing the $105 billion recorded in 2000. This demonstrates the overall trend of venture managers participating in larger rounds of financing as a reaction to the increasing maturity of companies in the market. This time last year, many projected that by the end of 2018 China would outpace the U.S. and become the largest venture capital market in the world. Three quarters through the year, China’s position as the new global venture leader seemed likely as U.S. and Chinese companies were neck and neck on mega-deal count and on a value basis. However, the U.S. made up ground in Q4, as China fell to raising just 21% of the reported global funding, likely due to the country’s economic slowdown in Q4, while 53% was netted by U.S. companies. 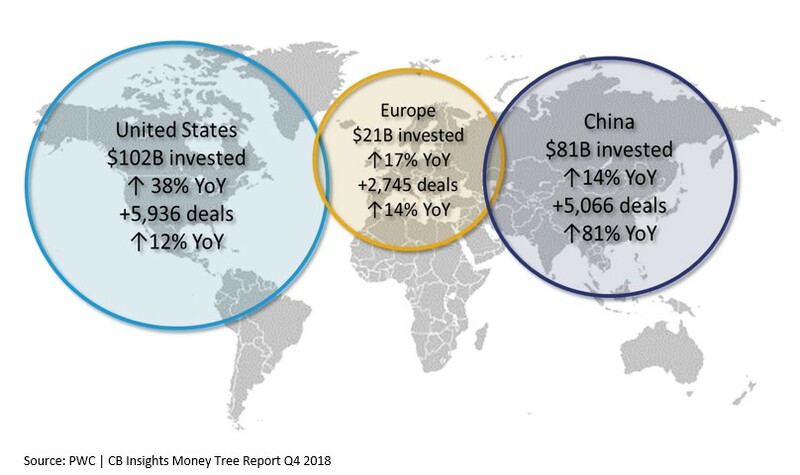 PitchBook reported ~$131B of capital was invested in 2018, it is clear that China continues to close in on the U.S. as the leading global venture market. 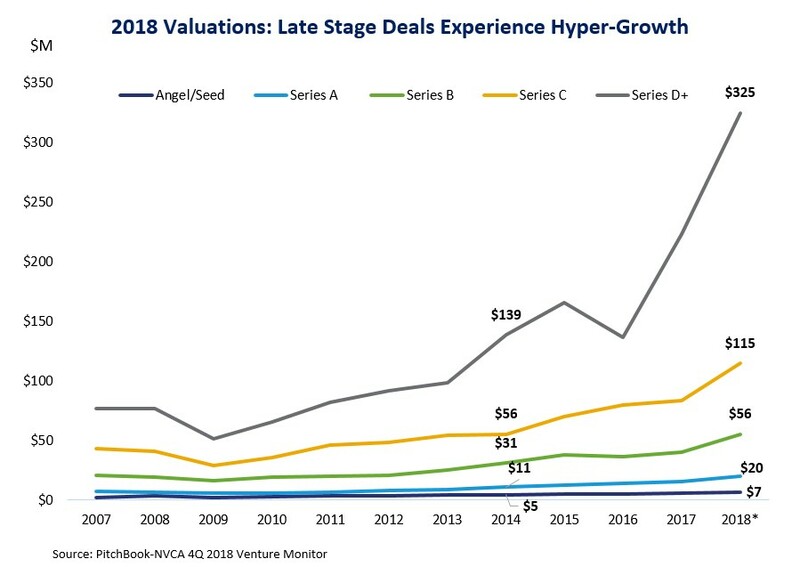 While valuations continue to climb across all stages of the venture market, deal share continues to favor the later stages of funding. By count, seed-stage deal share fell to 25%, representing its third consecutive year of decline as larger, later-stage deals continue to account for more of U.S. and global funding. The most dramatic of these valuation increases is seen at the latest stages, where in a three-year period, from 2016 to 2018, the median pre-money valuation grew 137% as large investors bought exposure to increasingly mature companies, allowing them to stay private longer. 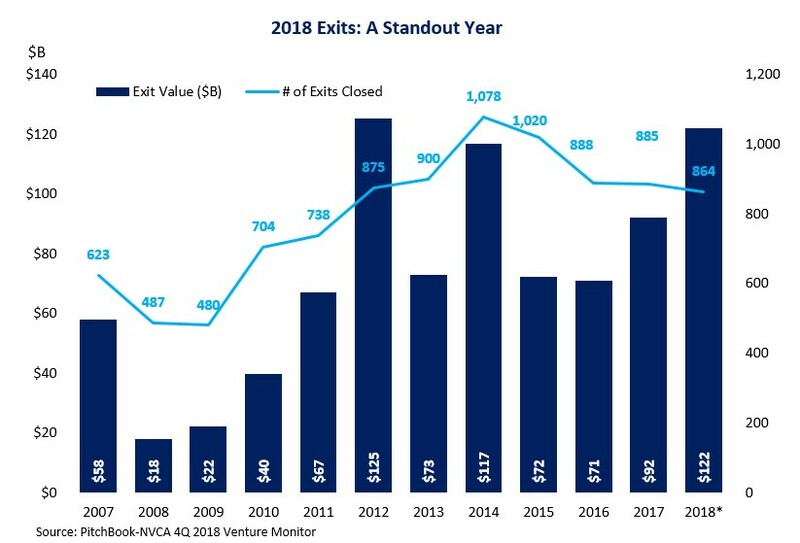 Despite a relatively flat exit count, 2018 displayed an exceptionally strong showing for venture capital backed exits on a value basis. With over $120 billion in exit value, 2018 experienced 33% year-over-year growth, signaling unwavering interest and a willingness of large corporations to pay up for quality companies as they continue to outsource innovation. While M&A managed to maintain its position as the favored exit type by count, the number of venture backed IPOs in 2018 jumped to 85, their highest level since 2014, and 2018 posted itself as one of the strongest years on an exit-value basis. Looking forward to 2019, we are optimistic that the venture capital industry will continue funding innovative technologies that will serve as the fundamental building block for society-altering products and services. While there is potential for a market correction or pullback, we find that it is reasonable to believe that deal sizes and valuations will continue their trend above long-term historical averages as we move into the new year. We believe there will be significant progress in artificial intelligence and machine learning as well as in frontier technologies, such as autonomous driving. We look forward to the full-scale buildout of the e-sports industry and the curative abilities of precision medicine. We are confident that the market will remain competitive as investors continue to raise significant capital, and we eagerly anticipate, like many others, the eventual IPOs of some of the decade’s largest private companies. Please feel free to share all your comments and feedback. Follow @TTCP_SF for the latest updates and insights.